Google Allo, the most brilliant messaging app from Google has been launched worldwide for iOS and Android smartphone users with some exciting features such as photo sharing and smart reply option with heaps of stickers and emojis and many more. 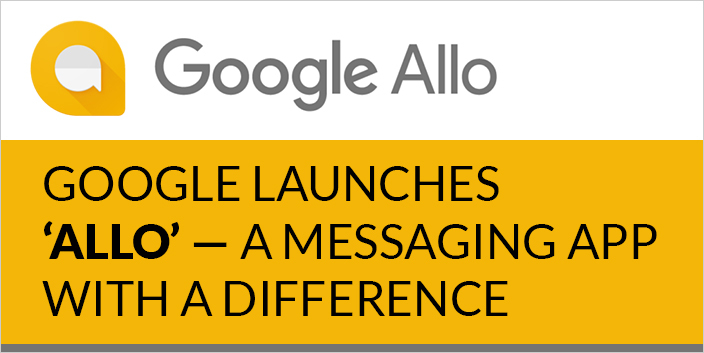 Tech giant Google, known for its sophisticated tech innovation, has added another feather in its cap by announcing the launch of its brand new smart messaging app— ‘Google Allo’ for iOS and Android smartphone users, worldwide. The myriad exciting features of Allo, such as photo sharing and smart reply option with heaps of stickers and emojis make it stand out as the most brilliant messaging app in the market today. Besides this, Allo also allows you to text your friends who are not yet using this app, via SMS. What’s more, Google Allo also features Google Assistant to assist users in making plans or finding relevant information or videos, as and when required. When it comes to emojis and stickers, Google Allo has the potential to outsmart all other existing messaging apps available on Play Store. To make chat sessions engaging and cheerful, Allo features a vast collection of emojis and over 25 downloadable sticker packs to suit your different moods. Allo also enables you to resize your text and the emojis you send as per your choice. Google Allo not only allows you to share photos but you can also use its Doodle feature to scribble on your photos before sending them to your near and dear ones. Smart-reply feature: Allo’s smart-reply feature adds the ‘fun-factor’ to your chat sessions by suggesting emojis and words to include. Moreover, it also analyses photos received by you and suggests replies such as “You look beautiful”. This feature suggests texts and emojis based on your personality and the frequency of specific words used by you while chatting, such as ‘LOL’ instead of ‘Haha’, or ‘TTYL’ or ‘catch you soon’. Google is concerned about your privacy. To keep your interactions safe and secure, Google Allo makes use of TLS (Transport Layer Security) technology which helps in encrypting your texts. (iii)Message Expiration that automatically makes your texts disappear once the texts have expired. The expiry time ranges from five seconds to 1 week. Chats generally entail making plans with friends, colleagues or clients. For example, if you are planning for a weekend luncheon with your friends or a movie date, Google Assistant will assist you by suggesting restaurants nearby, including movie times. At the same time, you can also have a one-on-one interaction with your Google Assistant in Allo. Though WhatsApp is already ruling the market today as the most-preferred messaging app, Google Allo’s new additional features may soon steal the limelight and take the lead globally. However, only time will tell if Allo will succeed in replacing WhatsApp or get lost in the muddle of bandwagon messaging apps. Weekend Digital Media Round-up: Google’s payment app ‘Tez’, Facebook’s new group video chat app, Apple’s ARKit, and more..